I was recently inspired by phenomenal Mexican Chef Roberto Santibanez of Fonda restaurants while watching him work in the Saveur test kitchen, and then working at Creative Edge and collaborating to create the Happy Hearts Foundation event this past year. Ever since then I have been on a Mexican kick, slicing the needles off nopales, toasting chilis, and charring and pureeing various vegetables. One of my favorite meals in life are traditional enchiladas. Not the heavy American version stuffed with all kinds of meat and beans and smothered in cheddar cheese… the lighter, more flavorful Mexican version where corn tortillas are dredged through a delicious sauce made from dried arbol chilis and love, filled with a little meat, raw white onion, and cotija cheese, rolled and topped with more sauce, crema, chopped onion and cilantro. I love to take that same red chili sauce and braise large chunks of marbled beef until tender and falling apart. 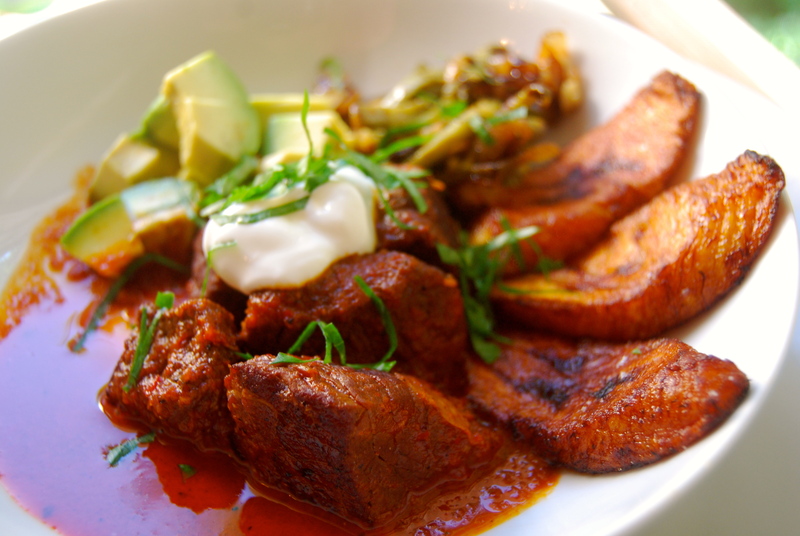 The flavor is so rich and balanced with the sweet heat of chilies and the buttery fat of the beef. I made this dish at my parents a few months ago and they were in love. 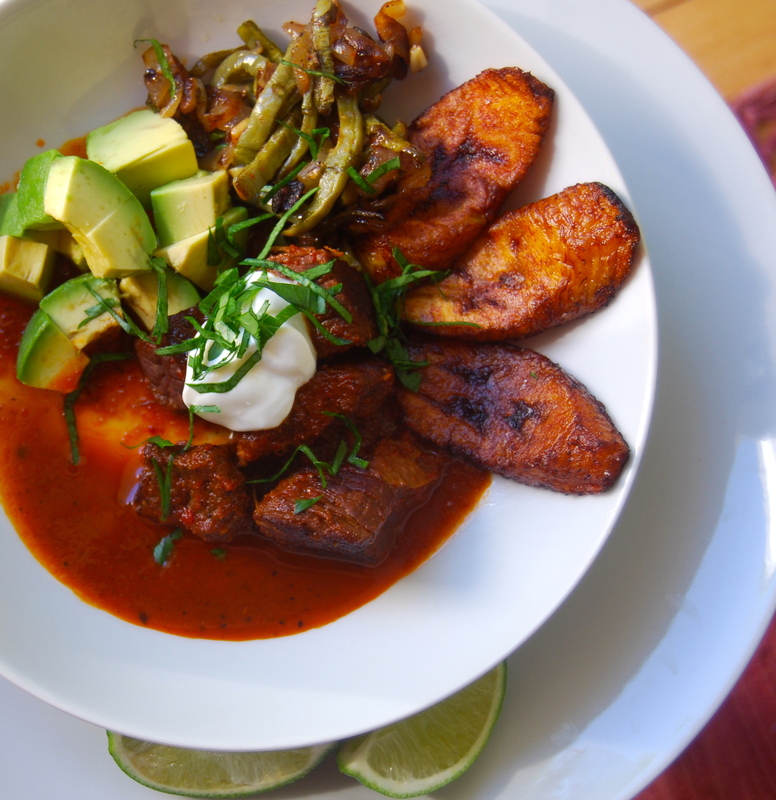 I served them this dish with fried plantains. Deliciously sweet and sprinkled with large flakes of salt, the perfect accompaniment to this rich dish. 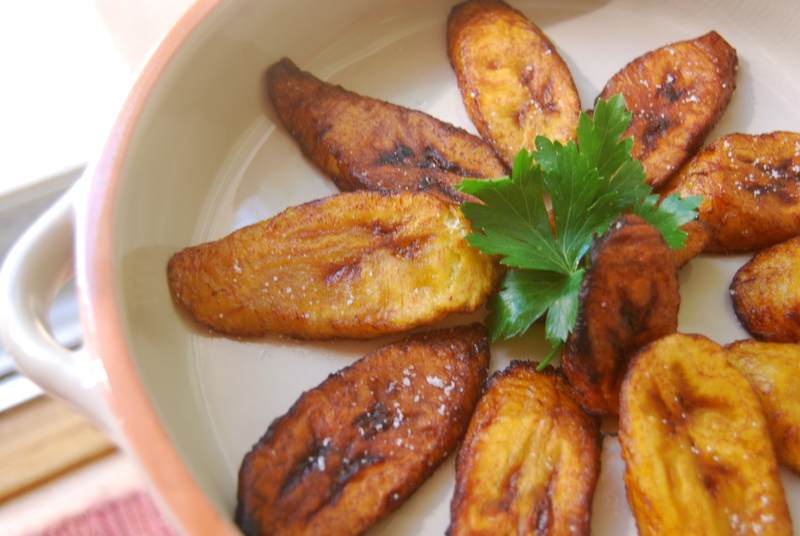 Fried plantains are a nice change from the norm, and a great side dish to many different meals. They are extremely inexpensive and are filling. The perfect side dish on a budget. In a large pot on your stove, fill less than halfway with vegetable oil. Bring the oil to 375 degrees. 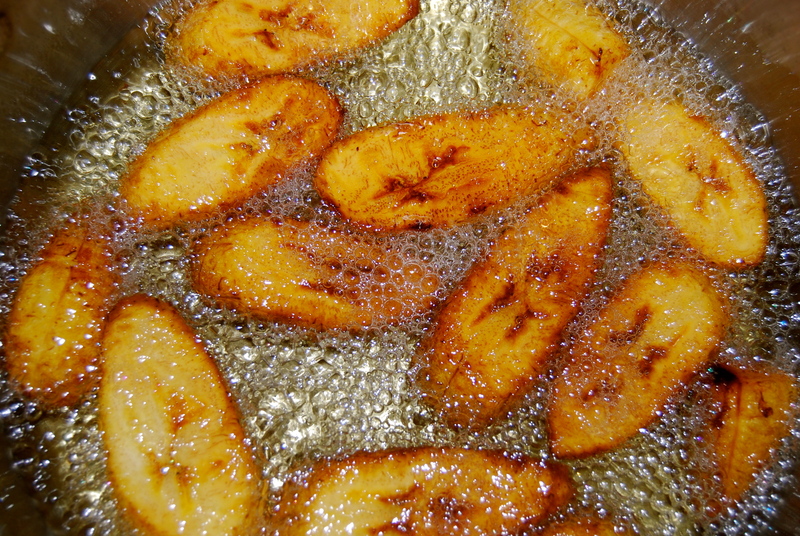 When the oil is to temp, gently add the plantains to the oil. Browning them on both sides – should be crisp on the outside and tender and soft on the inside – about 2-3 minutes. Let drain on a paper towel and sprinkle with salt. 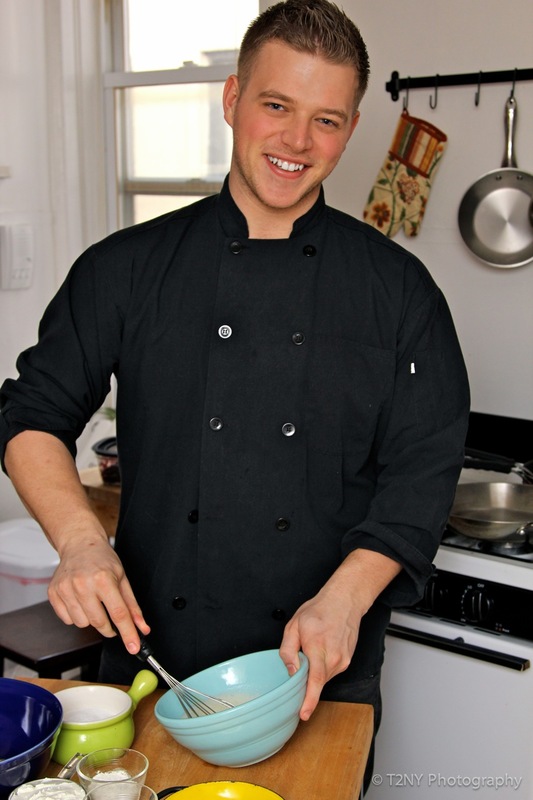 Serve hot – if you need to reheat them, put them in a single layer on a sheet tray in a 350 degree oven for 5 minutes. I hope you enjoy this delish side dish and don’t be afraid of frying at home, as long as you are careful, you have nothing to fear!